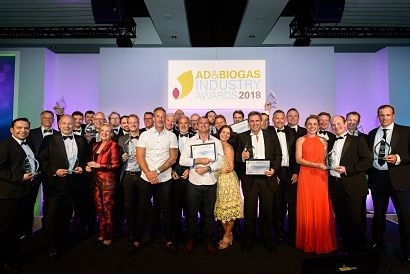 Innovations in anaerobic digestion (AD) and biogas were celebrated last night at the AD & Biogas Industry Awards Ceremony 2018, with 16 different awards presented to companies and individuals contributing to the delivery of AD and biogas across the UK and around the world. The ceremony was jointly organised by the UK Anaerobic Digestion & Bioresources Association (ADBA) and the World Biogas Association (WBA), and was held at the end of the first day of UK AD & World Biogas Expo 2018, the world’s largest tradeshow dedicated solely to AD and biogas. AD has the potential to reduce global greenhouse gas emissions by around 20 percent and can help to meet nine of the 17 UN Sustainable Development Goals. An industry which is based on one of the biggest transfers of money in modern UK history from ordinary folk to the already rich in the form of subsidies deserves everything it gets. Let us hope many AD plants will follow Crouchland. AD is a wonderful technology, but it has been corrupted thoroughly by subsidy. Awarding the illegal, irresponsible and environmentally damaging Crouchlands plant an award damns this organisation’s reputation. Were the advisory contributions that Aardvark gave to Crouchlands Biogas Ltd taken into account when giving the Award for Legal, Accounting and Consulting? The local community of Plaistow, West Sussex, suffered noise, pollution, dangers from huge lorries on narrow country lanes and worry from all the unlawful activities of Crouchlands Biogas Ltd which was advised by Aardvark over a number of years. Wow an award? Really? For what? The illegal biogas plant? Or maybe it was for all the leaks and destroying the local environment and wildlife? Did they pay to win this award I wonder? Maybe the people dishing out the award pulled a name from a hat as they certainly didn’t fully research this company the disregard for anyone effected or local to this plant. Or maybe they won because of the amount of tax £ they wasted fighting to run such a bad place as crouchlands. Disgraceful! Should such a firm be given any award at all? Personally back in 2009, I was all in favour of the original application for an AD plant to serve the farm.....until it grew Topsy without the right kind of planning permission, started operating as a regional hub, led to repeated contamination of the local stream 3 or 4 times, were taken to court by the Environment Agency, attracted enough HGVs on a rural lane that the Local Authority had to pay out over £400k to restore the surface and in addition caused havoc for the small local community which then had, together with the MPA, to take part in a Planning Inquiry at great cost which they WON.....if there are prizes to be handed out they should go to the legal team which assisted the local community. How can a group involved in the Crouchlands scandal, illegal planning, enviromental contamination and invasive transport almost destroying protected countryside in West Sussex be awarded this? This just shows how out of touch the industry is with reality, claiming to be enviromentaly concerned but really just out to make as much profit as it can at the cost of rural life. Scandal!! Shame on you! !